The identification of novel genes is critical to understanding the molecular basis of body weight. Towards this goal, we have identified secretogranin V (Scg5; also referred to as Sgne1), as a candidate gene for growth traits. Through a combination of DNA microarray analysis and quantitative PCR we identified a strong expression quantitative trait locus (eQTL) regulating Scg5 expression in two mouse chromosome 2 congenic strains and three additional F2 intercrosses. More importantly, the eQTL was coincident with a body weight QTL in congenic mice and Scg5 expression was negatively correlated with body weight in two of the F2 intercrosses. Analysis of haplotype blocks and genomic sequencing of Scg5 in high (C3H/HeJ, DBA/2J, BALB/cByJ, CAST/EiJ) and low (C57BL/6J) expressing strains revealed mutations unique to C57BL/6J and possibly responsible for the difference in mRNA abundance. To evaluate the functional consequence of Scg5 overexpression we measured the pituitary levels of 7B2 protein and PCSK2 activity and found both to be increased. In spite of this increase, the level of pituitary α-MSH, a PCSK2 processing product, was unaltered. Together, these data support a role for Scg5 in the modulation of body weight. Body weight, as with all complex traits, is partially regulated by the coordinate action of individual genes. One common approach for dissecting the genetics of growth is the mapping of quantitative trait loci (QTL). In the last decade numerous human and mouse growth QTL have been identified ; however, while this progress is important, few if any of the loci have been unequivocally resolved to the effects of a single quantitative trait gene (QTG). Several studies involving many different mouse inbred strains have demonstrated an enrichment of growth and obesity QTL on chromosome 2 [2, 3]. In our laboratory, we have developed a number of genomic resources with the goal of discerning the molecular basis of chromosome 2 QTL segregating between the C57BL/6J (B6), C57BL/6J-hg/hg (HG) and CAST/EiJ (CAST) strains [4, 5]. These include two congenic strains, B6.CAST-(D2Mit329-D2Mit457)N(6) (B62D) and HG.CAST-(D2Mit329-D2Mit457)N(6) (HG2D), constructed by introgressing an identical congenic donor region, extending from approximately 75 to 180 Mbp, from the CAST strain onto both B6 and HG backgrounds . HG mice exhibit extreme body weights without becoming obese due to the high growth (hg) deletion located on chromosome 10, which eliminates the expression of the suppressor of cytokine signaling 2 (Socs2) gene, a negative regulator of growth hormone signaling . The purpose of generating the HG2D and B62D strains was to capture the weight gain 2 (Wg2) QTL  and evaluate hypothesized interactions between Wg2 and hg. After construction, HG2D mice were not characterized due to reproductive problems, however, B62D mice displayed significant decreases in growth and obesity traits . In two follow-up studies it was determined that Wg2 was actually the result of multiple genes. In the first study, an F2 cross derived from the HG2D congenic and HG progenitor strain (referred to as the HG2DF2 cross) was used to identify a strong QTL located at 112 Mbp that decreased body weight at 6 and 9 weeks of age, but did not affect fat mass. This QTL partially explained the effects of Wg2 and was referred to as weight gain QTL 5 (Wg5) . In the second study, subcongenic mice derived from the B62D congenic (referred to as B62D-3), with a CAST donor region from 102–115 Mbp, were lighter and leaner due to the effects of a locus we named Wg2b . Based on their coincident genomic location, Wg5 and Wg2b are likely the same QTL, however, their differing effects on adiposity suggest that an interaction with hg may eliminate or decrease the fat reducing effects of Wg5. In the current study we have used DNA microarrays and public genomic databases to investigate the genetics of expression for genes located within the two congenic models, HG2D and B62D, to identify candidates for the Wg5 and Wg2b QTL. Based on its genomic location, differential expression and biological function, the most promising candidate is secretogranin V (Scg5; also referred to as Sgne1). The protein product of Scg5, 7B2, is a molecular chaperone for prohormone convertase 2 (PCSK2). PCSK2 is a member of the subtilisin-like proprotein convertase family and many PCSK2-generated peptides are either directly involved in glucose homeostasis (glucagon) or indirectly contribute to body weight regulation (α-MSH, CART, and nesfatin-1, to name a few examples). Knockout of peptide biosynthetic enzymes often result in mice with body weight phenotypes, most notably the fat/fat mouse with its inactivating mutation in carboxypeptidase E . While the PCSK2 knockout mouse is slightly runted but otherwise of normal weight , an obese PCSK1 mutant mouse has recently been described which has lowered levels of the PCSK2 product α-MSH , indicating possible interplay/feedback between the peptide synthesizing enzymes (also suggested by ). Scg5 has also been implicated in body weight homeostasis. Scg5 knockout mice (on a 129/SvEv background) exhibit a postnatal lethal phenotype in which all mice die by 5 weeks of age (due to intermediate lobe ACTH hypersecretion and rampant corticosteronemia); however, adrenalectomy rescues these animals and reveals a late-onset obesity phenotype . Collectively, these results point to potential roles for peptide biosynthetic enzymes, and specifically for Scg5, in body weight regulation. To identify differentially expressed genes within the HG2D congenic donor region that potentially underlie body weight and obesity QTL, we hybridized whole brain RNA from non-recombinant HG2DF2 mice (mice inheriting intact cast or b6 congenic haplotypes) from each of the three F2 genotypes (b6/b6, b6/cast and cast/cast)  to Agilent whole genome mouse microarrays. Comparison of normalized expression values identified 62 genes as differentially expressed at a false discovery rate (FDR) of <0.30 using an additive effects model (Additional File 1). Fifty-five of the genes (88.7%) were located within the HG2D congenic region (from approximately 75 to 180 Mbp). As confirmation of the microarray results, we next examined the genetic basis of expression for eleven genes (Cd44, AI451465, Fmn, Scg5, 2310032D16Rik, 3300001M20Rik, Pak7, Actr5, D930001I22Rik, Sdccag33l and Rab22a) identified as differentially expressed from the microarray study (Additional File 1). These genes were selected for confirmation because they were located near the peaks of previously identified HG2DF2 body weight and obesity QTL (Table 1) . Gene expression was measured in whole brain RNA from 45 recombinant HG2DF2 mice using quantitative PCR. Of the eleven genes, significant eQTL were identified for five (AI451465, Scg5, 2310032D16Rik, 3300001M20Rik and Actr5) (Table 1). Based on its close proximity to Wg5 , biological function and magnitude of differential expression, Scg5 was selected as the highest priority candidate gene. From the microarray analysis, Scg5 was the eighth most significantly differentially expressed gene, with an FDR = 0.10, and its expression was up-regulated by approximately 3.0 fold in non-recombinant cast/cast HG2DF2 mice (Additional File 1). qPCR analysis in HG2DF2 mice indicated the expression difference was due to a Scg5 eQTL located at 55.5 cM (approximately 115 Mbp) mapping with a maximum LOD score of 16.4 (Figure 1). The eQTL was primarily additive (a = -0.68 and d = -0.14), with cast alleles increasing expression. The eQTL explained 74.1% of the variation in Scg5 expression. The nearest marker, D2Mit207 (located at 9.7 cM or 111.8 Mbp), was less than 2 Mbp from the physical location of Scg5 (113.6 Mbp), strongly suggesting the variation controlling the difference in expression was local in nature (eQTL have traditionally been referred to as cis if the variation affecting expression lies in the differentially expressed gene as is the case for Scg5, however, true trans eQTL may also show a similar behavior. Therefore, we have adopted the use of the more general local and distant nomenclature recently proposed by ). Importantly, previously identified QTL for body weight at 9 weeks (Wg5)  and body mass index in HG2DF2 mice (located at 54 cM and 54.7 cM, respectively) were coincident with the Scg5 eQTL (Figure 1). Scg5 expression is regulated by a strong local eQTL on chromosome 2 and is coincident with QTL for body weight and body mass index in HG2DF2 mice. 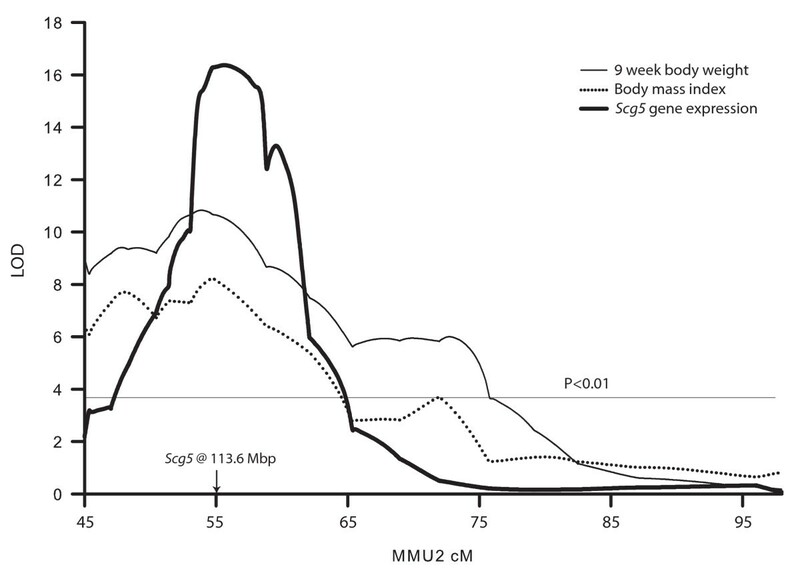 The plot presents the LOD score profile across the HG2D donor region for Scg5 expression, body weight at 9 weeks and body mass index. Genetic positions in centimorgan (cM) are plotted on the x-axis. The location of Scg5 (113.6 Mbp) is indicated with an arrow. To determine the effect of genetic background on transcriptional regulation of Scg5, we performed QTL analysis with expression data from three different crosses. Two were analyzed using the GeneNetwork resource for system genetics [15, 16]. The GeneNetwork contains microarray data on whole brain gene expression in B6 × DBA (BXD) recombinant inbred (RI) strains  and hippocampus gene expression in B6 × BALB (CXB) RI strains. QTL analysis for the levels of Scg5 expression revealed strong local eQTL in both crosses (Figure 2). Scg5 expression was also found to be under the control of a strong local eQTL using whole brain expression data from a recently described B6-ApoE-/- × C3H-ApoE-/- F2 intercross (BXH-ApoE-/- F2) (Figure 2) . In all three crosses B6 alleles decreased expression. Additionally, the expression of Scg5 was correlated with body weight in BXD and CXB mice, but not in the BXH-ApoE-/- F2 cross (Table 2). Thus, genetic variation near the Scg5 locus accounts for the majority of variation in mRNA levels in multiple genetic backgrounds, and importantly the low-expressing allele is unique to B6. A strong local eQTL on chromosome 2 regulates the expression of Scg5 in BXD, CXB and BXH mouse crosses. Mapping of Scg5 expression in A) whole brain from B6 × DBA (BXD) recombinant inbred (RI) mice, B) hippocampus from BALB × B6 (CXB) RI mice, and C) whole brain from BXH-ApoE-/- F2 mice. eQTL were identified using interval mapping tools available at [15, 16] for BXD and CXB crosses and R/qtl  software for BXH-ApoE-/- F2 mice. Since Scg5 is regulated by a strong local eQTL in HG2DF2 mice (Figure 1) we also expected it to be differentially expressed in wild type B62D-3 F2 mice. B62D-3 mice are wild-type with respect to the hg deletion and are congenic for cast alleles from 102–115 on chromosome 2 in the region of Scg5 . To confirm differential expression we measured mRNA levels in mice of all three B62D-3 F2 genotypes (b6/b6, b6/cast and cast/cast). As expected, Scg5 was up-regulated in cast/cast mice by approximately 2.5 fold (Figure 3). Additionally, if differential expression of Scg5 is causal for Wg5 (in HG2DF2 mice) and Wg2b (in B62D-3 mice), then its expression must correlate with growth traits and indeed its expression was significantly negatively correlated (P < 0.01) with body weight and obesity in both crosses (Table 2). Scg5 expression is up-regulated in B62D-3 F2 mice. The relative expression of Scg5 is presented for the three B62D-3 F2 genotypes (b6/b6, b6/cast and cast/cast). If an interaction exists between Wg5 and hg (as has been hypothesized in [4, 7]), it may be mediated via alterations in Scg5 expression. To determine if expression is altered by hg, Scg5 was quantified in HG and B6 mice at 3, 4.5 and 9 weeks of age. At all three time points the relative expression of Scg5 in whole brain was increased in HG mice (Additional File 2). A suggestive (P < 0.10) 25% increase at 3 weeks was followed by approximately 40% increases at 4.5 (P < 0.05) and 9 weeks (P = 0.06). The hg deletion encompasses three genes; Socs2, Raidd and Plexin C1 . The extreme growth rate and mature body size of HG mice (homozygous for the hg deletion) is primarily (if not entirely) due to the absence of Socs2 . In Socs2-/- mice increased growth is dependent on Stat5b . The DNA sequence required for Stat5b binding has been well characterized .Stat5b is the primary transcription factor responsible for mediating Gh induced gene expression changes  and a modest increase in its activity has been identified in Socs2-/- mice . To identify putative Stat5b binding sites which may be used by Gh (via Stat5b) to regulate the increase of Scg5 expression in HG mice, we screened 72.683 Kbp of Scg5 genomic sequence for the presence of the Stat5b consensus transcription factor binding site TTCYNRGAA (Y = T or C and R = A or G) . The sequence included all introns and exons and 10 kbp of 5' and 3' genomic sequence. In total six consensus sites were identified (Additional File 2). Interestingly, two tandem sites in the Scg5 promoter were located between -56 and -39 (relative to the transcription start site; Additional File 2). The probability that these sites occur by chance is 418, suggesting they are functional and may mediate the increased expression of Scg5 in HG mice. It is likely that most polymorphisms giving rise to local (truly cis) eQTL will reside within promoter or intronic based regulatory elements . With this in mind, we analyzed the genomic sequence of Scg5 to identify putative polymorphisms that may be responsible for the strong local eQTL. This is important since it could lead to the discovery of novel modes of Scg5 transcriptional regulation. Based on the eQTL results from multiple crosses, we hypothesized that two haplotypes should exist in the genomic region containing the eQTL, one unique to B6 (low expressers) the other shared between CAST, BALB, DBA and C3H (high expressers). To identify potential regions, haplotype blocks were identified by downloading all SNPs within Scg5 from the Mouse Phenome Database [24, 25]. A total of 191 SNPs were identified between 113.571079 and 113.633403 Mbp on chromosome 2 (Additional File 3). This 62.324 Kbp region encompassed the entire Scg5 coding sequence, promoter, over 5 Kbp downstream and the 3' end of Arhgap11a, which is located 2.4 kbp upstream of the first Scg5 exon. As predicted, two haplotype blocks were identified using the Haploview software package . Block 1 extended from the beginning of the queried region at 113.571079 Mbp to 113.581978 Mbp (10.899 Kbp) and block 2 spanned from 113.582743 Mbp to the end of the interval at 113.633403 Mbp (50.660 Kbp) (Additional File 3). Block 1 did not fit the necessary criteria of being unique to B6 (B6 and CAST were very similar across this block), however, block 2 consisted of three predominant haplotypes, one unique to B6, one unique to CAST and the other was highly similar among C3H, DBA and BALB. Although CAST differed from all other strains across the whole block, it was much more similar to C3H, DBA and BALB in the region corresponding to exon 2 and the first two introns. The haplotype similarities and differences across both blocks are shown in cladograms in Additional File 4. Therefore, since the region of haplotype block 2 contains a haplotype unique to B6 and similar among the other strains it is likely the genetic variant underlying the eQTL is located in this region. SNPs are numbered based on position upstream from transcription start site as defined by RefSeq NM_009162,. SNPs with genotypes in bold italics segregate low expressers and high expressers. +, deletion not present in these strains; del, deletion is present in these strains; N/A, genotypes for -306 were not determined for strains with deletion due to the forward primer sequence overlapping the deletion. To characterize the molecular consequences of Scg5 up-regulation, the levels of 7B2 protein, Pcsk2 gene expression, PCSK2 activity, α-MSH and ACTH levels were quantitated in B62D-3 F2 mice. The levels of pituitary (pit) 7B2 mirrored the differences in whole brain Scg5 expression in mice of differing B62D-3 genotype. b6/b6 mice had the lowest levels with 1.25 ± 0.04 pmol/pit, b6/cast mice followed with 1.34 ± 0.04 pmol/pit while cast/cast mice had the highest levels of 1.55 ± 0.04 pmol/pit (Figure 4). The difference between b6/b6 and cast/cast mice was highly significant (P < 0.01). In addition, the activity of PCSK2 also increased coincident with Scg5 mRNA abundance and 7B2 protein levels (Figure 4). 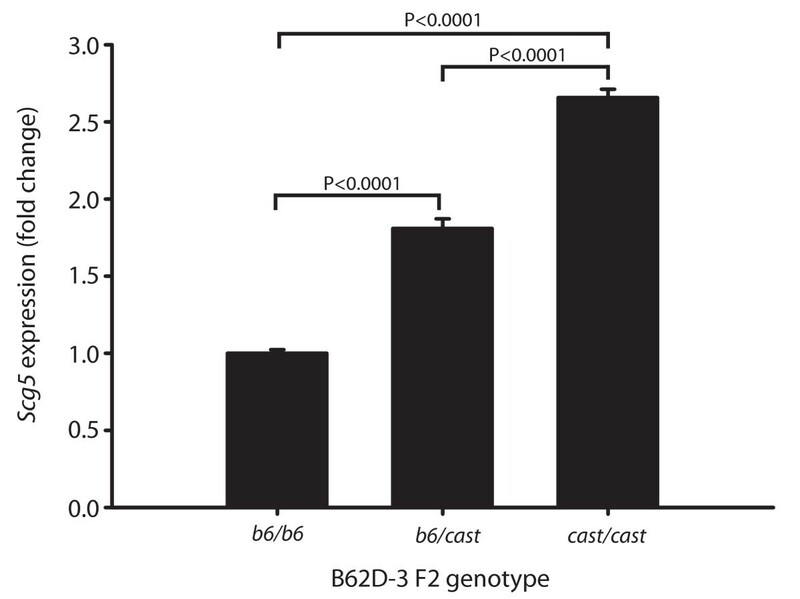 The difference in activity between b6/b6 and cast/cast genotypes was 27%. All pairwise genotype comparisons were highly significant (P < 0.0001). The distal border of B62D-3 ends at 115 Mbp and Pcsk2 is located on chromosome 2 at 143 Mbp. Therefore, the difference in PCSK2 activity could not result from CAST and B6 allelic differences at the Pcsk2 locus. To rule out distant-regulation of Pcsk2 in B62D-3 mice we measured Pcsk2 mRNA levels. No difference in expression was observed due to B62D-3 genotype (Figure 4). α-MSH and ACTH are secreted peptides, both products of convertase-mediated proopiomelanocortin processing in the pituitary. Although PCSK2 activity was increased, no differences were seen in the tissue levels of either peptide (Figure 4). 7B2 levels and PCSK2 activity are increased in B62D-3 F2 mice overexpressing Scg5 . A) 7B2 pituitary levels, B) Pcsk2 mRNA expression, C) PCSK2 activity, D) pituitary α-MSH and E) pituitary ACTH levels in the three B62D-3 F2 genotypes (b6/b6, b6/cast and cast/cast). In the current study we have demonstrated that transcriptional variation in Scg5 across several inbred strains is mediated almost entirely by local genetic variation near the Scg5 locus. More importantly, we have demonstrated that an increase in Scg5 expression is correlated with decreases in body weight and obesity in two congenic mouse models and overexpression results in an in vivo increase in 7B2 protein levels and PCSK2 enzymatic activity. By analyzing the expression of Scg5 in multiple segregating populations we have conclusively shown that nearly all of the variation in Scg5 expression is due to a strong local-acting variant. In all four crosses surveyed, the eQTL accounted for over 75% of the variation in Scg5 expression. Haplotype analysis using a recently generated high-density SNP collection indicated that the most probable location for the Scg5 local eQTL quantitative trait nucleotide was the promoter through the first four exons/introns. In the Scg5 promoter, four polymorphisms unique to the high-expressing strains were discovered. Of particular interest is del-432, an 11-bp deletion present in all strains except B6 and CAST. Although the deletion is absent in CAST, these mice are polymorphic at position -432 (possessing a T allele instead of the C allele in B6). It is tempting to speculate that this region is important for binding of a transcriptional repressor and that -432 is a key nucleotide. The action of Scg5 overexpression on body weight may represent either a direct effect of 7B2 or an indirect effect mediated by PCSK2-generated peptides. In this regard, it should be pointed out that it is not yet clear that 7B2 is always regulatory for PCSK2-mediated peptide production. A recent paper showing that the varying 7B2 levels synthesized by two different mouse strains are associated with differential production of glucagon  supports the notion that 7B2 levels do modulate in vivo peptide production, possibly by regulation of PCSK2 activity. However, our present results do not support an obligatory association of increased peptide production by increased PCSK2 activity, since we observed no changes in pituitary α-MSH, a PCSK2 product, even though tissue PCSK2 activity increased. While two studies have shown that introduction of 7B2 into cells which lacks all 7B2 production facilitates the generation of PCSK2-mediated peptides [28, 29], when cells already express some Scg5, additional 7B2 introduction does not always increase peptide production. An example is the transfection of Scg5 into AtT-20-PC2 cells, a neuroendocrine cell line which endogenously produces 7B2. The additional increase of 7B2 neither increases α-MSH production nor facilitates any other PCSK2-mediated peptide cleavage examined to date  and SNL and IL, unpublished results). Presumably other factors, possibly cell- or tissue-specific, can override any effects of additional Scg5 expression to limit the total amount of peptide made. In this regard it is important to note that we measured PCSK2-mediated peptide production only in pituitary; PCSK2/7B2 effects may also occur in other tissues more intimately involved in energy homeostasis, such as the hypothalamus. If the action of 7B2 on body weight homeostasis is not mediated via generation of PCSK2-mediated peptides, then it may result from a direct effect of 7B2 itself. It is currently impossible to speculate on the mechanism for this effect; however, this interesting pan-neuronal protein may have many unexplored roles. A recent paper describes the association of human neuroblastomas with the epigenetic down-regulation of 7B2 . In this study, loss of 7B2 expression was associated with increased tumor formation, suggesting that 7B2 expression may contribute to the maintenance of neuronal differentiation. Although we have provided several lines of evidence supporting the role of Scg5 in body weight regulation, that is in agreement with a prior knockout study demonstrating an increase in body weight in the absence of Scg5 , we have not demonstrated a direct causal link between Scg5 overexpression and reductions in body weight. It is possible that the local eQTL, regulating Scg5 expression, is in tight linkage with the actual causal variant(s) responsible for Wg5. It will take additional studies, such as generating a Scg5 transgenic mouse to confirm its involvement in body weight regulation. In the current study we have shown that in addition to the effects of the strong eQTL, Scg5 is up-regulated in HG mice, suggesting that this gene is responsive to growth hormone signaling. As discussed above, HG mice lack expression of Socs2. The absence of Socs2 leads an increase in the activity of Stat5b in Socs2-/- mice a factor which mediates the transcriptional effects of growth hormone . The molecular and physiological consequences of this increase are unclear; however, it should be noted two previous studies have provided data supporting an interaction between hg and chromosome 2 QTL [4, 7]. It is possible that the increase in Scg5 expression underlies this interaction. We have provided data to support Scg5 as a candidate gene for body weight homeostasis. Further, our results show that expression of the Scg5 gene product, 7B2, is likely to be controlled by strain-dependent promoter polymorphisms and that this difference in expression leads to an increase in the enzymatic activity of PCSK2. The mechanism by which increased 7B2 levels contribute to body weight is unclear as yet, but may represent a PC2-independent effect of this widely-expressed neuroendocrine gene. 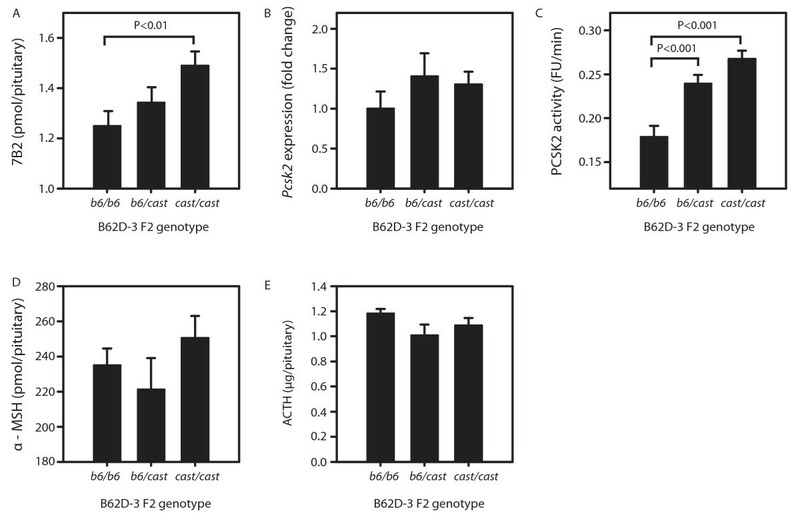 Phenotypic and gene expression data were generated from two inbred strains (B6 and HG ), a subcongenic strain (B62D-3 ) and two congenic-derived intercrosses (HG2DF2  and B62D-3 F2 ). In addition, Scg5 sequence data were collected from four inbred strains C3H/HeJ (C3H), DBA/2J (DBA), BALB/cByJ (BALB) and CAST and Scg5 expression data were obtained from three additional crosses not produced in our laboratory, the BXD RI, CXB RI and BXH-ApoE-/- F2 [16, 18]. All animal protocols were managed according to the guidelines of the American Association for Accreditation of Laboratory Animal Care (AAALAC). 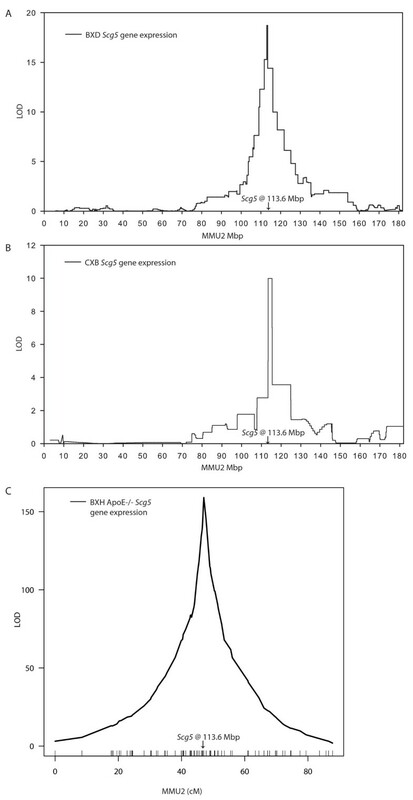 Total RNA was isolated using TRIzol reagent (Invitrogen) from homogenized whole brain samples. Whole brain total RNA from four male non-recombinant (hg/hg, hg/cast or cast/cast across the entire congenic interval) mice was used for microarray analysis. Two samples from each genotype were labeled with each dye (Cy3 or Cy5) using the Agilent Low RNA Input Fluorescent Linear Amplification Kit (Agilent Technologies). Samples were hybridized on the Mouse Whole Genome Oligo Microarray (Agilent Technologies) using an incomplete loop design. Using two arrays, two hg/hg samples (one labeled with Cy3 and the other Cy5) were hybridized with two reciprocally labeled cast/cast samples (i.e. hg/hg Cy3 was hybridized along with cast/cast Cy5). Four additional arrays were used for the other two genotype combinations (hg/hg vs. hg/cast and cast/cast vs. hg/cast). TIFF images were obtained using the Agilent DNA Microarray Scanner BA (Agilent Technologies) and intensities were measured with the accompanying Feature Extraction Software. Intensities were normalized by linear and LOWESS regressions and background corrected by subtracting the trend of minimum intensities along the surface of the slide. Data were then analyzed with the maanova package [33–35] from the Bioconductor suite for R . Genes were tested both for additive and dominance effects by setting the appropriate contrasts in the mixed model yijkl = Dyei + Arrayj + Genotypek + Errorijkl where Dye and Genotype are fixed and Array and Error are random effects. P-values were corrected for multiple comparisons using an FDR transformation . Duplicate qPCR reactions were carried out with 25 ng of cDNA using ABI Gene Expression Assays (Applied Biosystems) for each gene on the Applied Biosystems 7500 Fast Real-Time PCR System (Applied Biosystems). The ABI Gene Expression Assays were as follows: AI451465, Mm00505280_m1; Fmn, Mm00439021_m1; Scg5, Mm00486077_m1; Cd44, Mm01277160_m1; 2310032D16Rik, Mm00512140_m1; 3300001M20Rik, Mm00558305_m1; Pak7, Mm00556184_m1; Actr5, Mm00615134_m1; D930001I22Rik, Mm00557752_m1; Sdccag33l, Mm01248119_m1, Rab22a, Mm00508287_m1; and Pcsk2 Mm00500981_m1. Sdha (succinate dehydrogenase complex, subunit A, flavoprotein (fp)) and Gus (beta glucuronidase) were used as endogenous control genes. They are not located in the congenic region (Sdha is on MMU13 at 70.4 Mbp and Gus is on MMU5 at 129.2 Mbp) and both are common, stably expressed control genes. The control corrected expression of each target gene was determined as ΔCt = Ct (target gene) - Ct ((Sdha Ct + Gus Ct)/2). These measurements (ΔCt) were then subjected to interval mapping using the "scanone" function of R/qtl . Mouse age, litter size and dam's parity were used as additive covariates. The "fitqtl" function was used to estimate genetic effects and percent variance explained. qPCR reactions for Scg5 and Pcsk2 were performed in B62D-3 mice as described above. The expression of each target gene was determined using the expression, 2-ΔCt, where ΔCt = Ct (target gene) - Ct (control gene). These values were analyzed with SAS using a linear model that included the fixed effects of genotype . The expression of Scg5 was also measured in whole brain from five HG and B6 mice at 3 WK, 4.5 WK and 9 WK. qPCR was carried out as described above and Sdha normalized expression levels (2-ΔCt) were calculated for each sample. These values were analyzed with SAS using a linear model that included the fixed effects of strain, age and strain by age interaction . The mean values for HG at each age were then scaled to B6 expression levels. PCR amplicons (Additional File 5) covering approximately 2500 bp upstream of the Scg5 transcriptional start site were sequenced from the B6, HG, CAST, BALB, DBA, and C3H strains. PCR amplified fragments were gel purified using the Qiagen QIAquick gel extraction kit and sequenced at the High-Throughput Genomics Unit at the University of Washington. All of the following extraction steps were performed at 4°C. Pituitaries were briefly sonicated in 100 mM sodium acetate, pH 5.0, and 1% Triton ×-100 in the presence of a protease inhibitor cocktail composed of 1 μM pepstatin, 1 μM trans-epoxysuccinic acid (E-64), and 1 mM phenylmethanesulfonyl fluoride (PMSF). The extracts were centrifuged for 2 min at 15,000 × g. The supernatants were used for PC2 enzyme assays. The assay for PC2 was carried out in triplicate in 96 well polypropylene microtiter plates using 10 μl of each sample in a total volume of 50 μl containing 200 μM fluorogenic substrate, pyr-Glu-Arg-Thr-Lys-Arg-methylcoumarinamide (MCA) as a substrate and 100 mM sodium acetate buffer (pH 5.0) containing 5 mM CaCl2, 0.5% Triton ×-100 in the presence of a protease inhibitor cocktail above with the addition of 0.14 mM tosyllysyl chloromethyl ketone (TLCK) . The activity was also separately measured in the presence of 1 μM 7B2 CT peptide, a specific inhibitor of PC2 . The fluorescent product MCA was measured with a Fluoroscan Ascent plate fluorometer. The amount of released product was calculated by reference to the fluorescence of the free MCA standard and is given in fluorescence units (FU) per minute, in which one FU corresponds to 5.33 pmol of MCA. These values were analyzed with SAS using a linear model that included the fixed effects of genotype . Pituitaries were homogenized by sonication in 250 μl of ice-cold 0.1 N HCl. The samples were stored frozen, thawed, and centrifuged for 15 min at 13,000 rpm (17,383 × g) at 4°C. The supernatant was lyophilized and resuspended in 0.5 ml of radioimmunoassay (RIA) buffer (100 mM sodium phosphate, pH 7.4, containing 0.1% heat-treated BSA, 50 mM NaCl, and 0.1% sodium azide). All samples were stored frozen at -70°C until use. For 7B2 assays, 50 μl of pituitary samples were subjected to assay in duplicate. The polyclonal antiserum against 7B2 (LSU13BF), directed against residues 23–39 of 7B2 , was used to detect 7B2. 125I-labeled 7B2 was prepared by the chloramine-T method originally described by Hunter and Greenwood  RIAs were carried out according to protocols described previously . Samples were incubated with 10,000 cpm of iodinated peptide and the appropriate dilution of rabbit antiserum in a final volume of 300 μl at 4°C overnight. To separate the antibody-bound labeled peptide from the unbound labeled peptide, 1 ml of 25% polyethylene glycol and 100 μl of 7.5% carrier bovine γ-globulin (in PBS) were added. The samples were vortexed, kept on ice for 30 min, and then centrifuged for 20 min at 3,000 × g at 4°C using a Sorvall RT6000B refrigerated centrifuge. The supernatant was aspirated, and the radioactivity in the pellets was determined. These values were analyzed with SAS using a linear model that included the fixed effects of genotype . 10 μl of a 1/200 dilution pituitary sample in RIA buffer were subjected to assay in duplicate. The polyclonal anti-α-MSH antiserum was commercially purchased from Chemicon (Temecula, CA). α-MSH assays were performed as described above. ACTH assays were carried out using the two-site Nichols human ACTH1–39 assay kit (Nichols Institute, San Juan Capistrano, CA). The 125I-ACTH antibody used in this kit is directed towards both N-terminal and C-terminal regions of intact ACTH molecule and does not recognize ACTH cleavage products. These values were analyzed with SAS using a linear model that included the fixed effects of genotype . The authors would like to thank Karen Reue and Laurent Vergnes for kindly providing BALB, C3H and DBA DNA. Additionally, we thank Susanna Wang, Eric Schadt and Aldons J. Lusis for providing Scg5 expression data from BXH-ApoE-/- mice. We also acknowledge Vince De Vera for mouse care and Kerri Morimoto, Karina Guevara, Lee Nguyen and Anna Chen for assistance with mouse phenotyping. This work was supported by the National Research Initiative of the USDA Cooperative State Research, Education and Extension Service, grant number 2005-35205-15453 and NIH grants DK69978 to JFM and DK49703 to IL. CRF was supported by an Austin Eugene Lyons fellowship. CRF, IL and JFM conceived the study. CRF, JC, SNL, RAV and AIT performed all experiments. CRF, RAV and JFM analyzed the data. CRF, IL and JFM drafted the manuscript. JFM provided coordination of the project. All authors read and approved the final manuscript.